During an April visit to the San Francisco home of billionaire and environmental activist Tom Steyer, who created a political action committee in March to target lawmakers supporting the Keystone pipeline, Obama noted that the issue of climate change “is near and dear” to Steyer and his wife, Kat Taylor. I loved Obama’s description of economic trouble, characterizing it as “if your house mortgage is underwater” … around my place, that’s what is affectionately known as a “First World Problem”. But it beautifully illustrates the close relationship between economic want and lack of concern for the environment, even among people with money. Let me start with the two most important facts in the discussion about the global environment. First, half the people on the planet live on less than $2 and change per day. That’s why I said having your house mortgage underwater is a “First World Problem”. People living on $2 per day don’t have house mortgages—most of them don’t own houses, or much of anything beyond a few rags of clothing. Climate alarmists, with the strong support of the major environmental NGOs like Greenpeace and WWF, declared war on CO2. The method that they chose to fight CO2 was to discourage fossil fuel use by making energy more expensive, using a combination of taxation, legislation, international pressure, and expensive subsidies to achieve that end. Obama’s War on Coal, announced today, is just one of hundreds of examples of the wealthy NGOs and the rich governments working to increase the price of energy. Since energy is development, expensive energy keeps poor countries in poverty. When the World Bank denies loans for coal fired plants in India, the poor suffer … but the environment suffers more. Until they can afford to use coal and gas, they’ll run the country on wood … I refer you back to Figure 1 for how well that works out. Expensive energy slows a country’s economic development, and as President Obama pointed out, people worried about money don’t pay attention to the environment. This ends up in a bizarre position—the actions of the major environmental NGOs are ensuring continued environmental destruction in the developing world. I learned about the connection between poverty and environmental destruction in part through sad experience. I discussed my conversation with the indigent Costa Rican firewood seller, and how he was cutting his firewood in the National Forest, in my post on the parrotfish. Here’s the story of a longer and sadder interaction with poverty and the environment. For a couple years in the late 1980s, I was the Country Director of the Solomon Islands program of a development organization, something along the lines of “Save the Children” but with a more general focus. Among the projects I ran was the “Walkabout Sawmill” program. It was a winner. Instead of giving money for disaster relief after a cyclone, we bought some portable sawmills made next door in Papua New Guinea. We trained some teams of guys to use the sawmills, and sent them around to the villages to mill the trees that had been blown over by the cyclone. The villagers got wood, our guys learned to use the sawmills. Then when the project was over, we sold the sawmills on credit to the teams of guys, so that they could use them to log their own native lands. Why was I glad to assist them in logging the forest? Because I knew that it was far preferable to the only other option, which was the rapacious Asian logging companies coming in and clear-cutting huge swaths of land. Because of their poverty, the Solomons were selling their patrimony, their incredibly valuable tropical hardwoods, for pennies. And how did their poverty lead to the loss of their forests? I can give you the answer. When a country is poor, you can buy anything. For several years in the late 1980s I lived on a coral atoll near a large volcanic island with the most euphonious name of “Vella Lavella”, in the Western Province of the Solomon Islands. At that time the Solomons had extensive tropical forests full of very valuable hardwood. Overseas logging companies were coming in, paying pennies to the villagers for their logs, paying off the customs inspectors, and shipping away barge after barge of the treasure and the patrimony of the islands, their tropical trees. So I was happy to be able to offer the people the alternative of harvesting and tending their own forest. So at that time, a Malaysian company made a move to get the rights to log all of Vella Lavella island. Some people said no, but there were some that wanted it. There’s a kind of local island council, with about five “Big Men”, local leaders, who make the decisions. People were passionate about the logging issue, as you might imagine. There was a meeting of the island council, and the logging company made their presentation. The big men, to their credit, voted the logging down. So the company pulled out their wallets, and bought them off right there on the spot. After the folks had left, they declared the Council back in session, and voted the logging rights to the company. The only problem was, the results of the first meeting had already been entered in the official record. Of course, it’s the Solomons, and these were local guys untutored in the criminal arts. So they just took some whiteout, and whited out where they had said “No logging”, and wrote the revised vote right over the old one. When I heard that, I was both amused and outraged. So some of us got the Public Solicitor to take on the case, he was enthusiastic back then, it was before his illness. He ended up catching the disease that a lot of white guys catch in the tropics, it comes in a bottle and makes you feel terrible, but this was before he got sick. So he argued the case brilliantly and got the decision thrown out of court, we all cheered him on and felt like we’d won. When the court decision was announced, the logging company did the obvious thing—this time they cheated according to the rules. They paid the island councilors off, but this time they paid them before the council meeting, so there was no need to change the official record … I was mondo bummed, as were my local friends. So that inexpensive purchase of the island councilors, I heard it was ten grand US$ per man, gave the logging company the right to negotiate a contract with the locals if they wanted to sign. One afternoon, some of the young Vella Lavella guys made the trip over to the island where I lived to ask if I would help them. I bought the beers, and we talked about the logging company. They said that they’d been agitating to convince the people to keep the company out and take care of their own forests. But the sentiment among the people was against them. They wanted the easy money, just sit back and let the company do the work. So they asked me, would I look at the contract and tell them what it was that logging company wanted them to sign? I said sure, and they gave me a copy of the accursed document. My friends, I’ve seen some sly, crafty ways to cheat and cozen someone with a pen and a piece of paper, but this one fair reeked of sulfur. Inside it, black was white and white black. Outrageous things were proposed as though it would be of benefit to the local folks. And the logging regulations themselves in the contract were abysmal. A 100-metre setback from streams and watercourses is considered the minimum to protect the waterways from sedimentation. They proposed a 10-metre setback and claimed they were doing it out of concern for the environment. Nor was there any limit to the gradient which they could log. Usually, steep slopes are protected from logging because the erosion and landslides are so damaging … they had no protection for them at all. Then there were the roads. One huge benefit of a properly managed logging operation is that the local people end up with roads connecting the coastal villages with the interior lands. Or it can be a huge curse, because if the roads are not properly designed and constructed, then they wash out in the tropical rains and the roadways erode into open cuts and the land takes years to recover. Well, this document pointed all of that out. It talked about the various quality of roads, from the logging roads in the interior all the way up to paved roads along the coast. There were pages of road specifications, and lovely black-and-white pictures of asphalt highways running by tropical beaches, with only one small problem. The document described the roads, and the places that they planned to use them, and how well made they would be … but nowhere in the whole document did they actually agree to build one single metre of road, paved or not. It was all just a smoke screen, they promised nothing. So I went over the whole document and marked it up. Then I met up with the guys again, and we went over the whole thing, clause by clause. I’d re-written about two-thirds of the clauses, and I’d worked with my friend the Public Solicitor, and we’d put together a document that would be a good deal for the locals. The loggers would still make out, but like businessmen, not like highway robbers. It was a long meeting, the guys had lots of questions, and we discussed each and every clause so they knew why I’d made the changes, and what the changes meant to them. After previous discussions with a couple of the guys, we’d also added a section setting up a trust for the majority of the money, so it wouldn’t all get spent on beer and outboards and be gone in six months. They were very much in favor of that, they’d seen money pissed away before. Then they were ready to meet with the representatives of the loggers. They asked me if I’d come with them to the meeting. I said I couldn’t … another expatriate that I knew had gone mano-a-mano with the loggers a few months before, and within a week his work permit had been pulled, and he had to leave the country. I couldn’t risk losing my work permit, but I said I knew they could do it, they understood the issues. They asked, could they meet in one of the guest houses that I rented out on the island? I said sure, no problem. They could have the meeting, and spend the night, go back to Vella the next day. So the big night came for the meeting. Everyone showed up, loggers and islanders. I played the genial host, and left them to discuss the fate of the forest. And in the morning? They all came out, shamefaced. I took one look, and my heart sank. I asked one of the old guys, one of the big men, what had happened. “Oh, the logger men were very nice! Can you imagine, they gave us a whole case of Black Label whiskey. They explained the contract, and it sounded wonderful, so we signed it” … oh, man, my blood was angrified mightily and I was in grave danger of waxing wroth … but I knew the old man, and he wasn’t a bad guy, just weak. So I curbed my tongue and shook my head, and I said that his sons might approve, but his grand children would wonder why he sold their birthright for pennies … then I went and talked to the young guys. They said they couldn’t stop it, once the big men were drunk they got combative and wouldn’t listen to anyone and they would have signed anything. At first I was furious with the logging company, for being so sleazy and underhanded as to get them to sign drunk. Then I thought, “Wait a minute …”. I thought, these Big Men are not American Indians who never tasted firewater in their life. They’ve all been drunk before, probably during that very same week. They know damned well what it does to your judgement. So then I was angry at them. But then I thought no, they were just weak and overawed by lack of education and experience and money. The logging company sent in educated, smooth, charming guys wearing fine, expensive clothing and flashing lots of gold, big rings, chains. The big men were all dressed alike—shorts and t-shirts, brought in used or factory seconds in bundles from Australia. I realized that rather than get embarrassed by their predictable inability to negotiate with the loggers, they had taken the easy way out and gotten drunk. Then I was angry at the young guys, for not standing up against the big men … that lasted about long enough to realize that under unbreakable tribal custom, they were expected and forced to defer to their elders, just as they would expect and demand that same deference when they got really, really old … like say fifty … life is short there. And at the end of the day, I realized that I was on a fool’s errand. Oh, I’d fight the fight again, in a minute, but I’d lose again. It’s what happens when big money hits a poor country—the environment gets screwed, whether it’s logging, fishing, or mining. Until the country is wealthy enough to feed its citizens and to protect itself, its resources are always on sale to the lowest bidder … by which I mean the bidder with the lowest morals. That is one of the main reasons that I’ve spent a reasonable amount of time working overseas trying to alleviate global poverty. I do it for the people first, but I do it for the environment second. And that is why I feel so personally betrayed by the current mindless push for expensive energy, a push led by the very organizations I’ve supported because back in the day, they actually used to be for the environment, not against it. Raising energy prices is the most regressive taxation I know of. The poorer you are, the harder you are hit by rising energy costs, and the more the poor suffer, the more the environment bears the brunt. Led in part by the environmental NGOs, many people and governments have declared war on CO2. Their preferred method of warfare is to raise energy prices, through subsidies, bans, taxes, renewable energy requirements, pipeline refusals, and the like. The rise in energy prices both impoverishes the poor and prevents the development of poor countries. As Obama pointed out, even wealthy people with economic worries tend to ignore the environment … so stomping on the development possibilities of poor countries by raising energy prices is a guarantee of years of environmental damage and destruction. 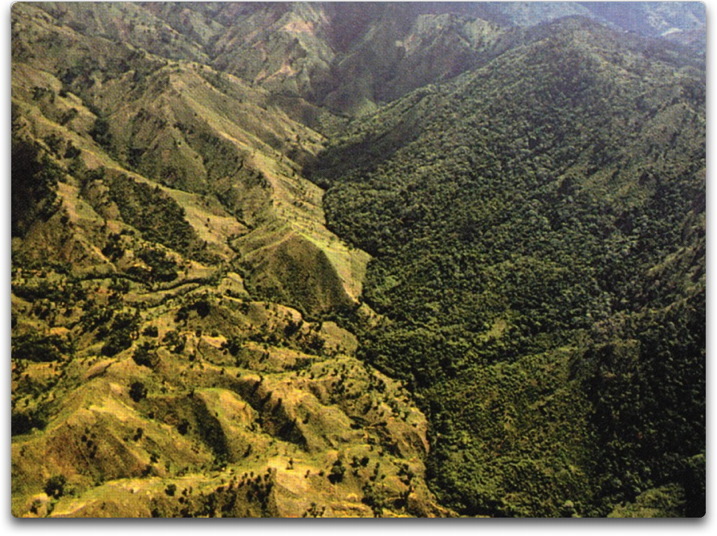 [UPDATE: For those who would like a bit more information on the connections between poverty and the environment that have lead to the photo shown in Figure 1, in 1960 Haiti and the Dominican Republic had the same per-capita real gross domestic product (GDP), They also had very similar physical conditions, as they share the same island. By 2012, however, the per-capita GDP in the DR had about grown to about $9,600 per year (PPP) … and the per-capita GDP in Haiti had shrunk to about $1,200, less than it was in 1960. 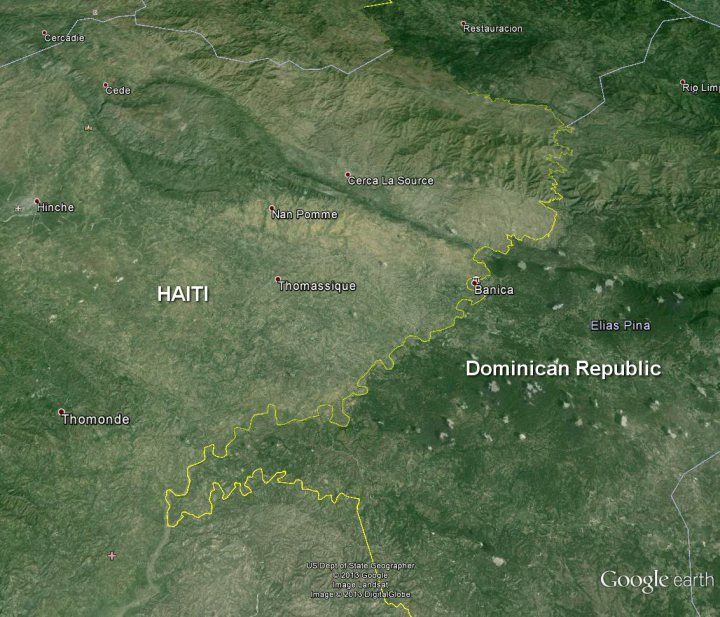 And as a result of the Haitians having almost no money at all, only an eighth of the GDP of the DR, both the people and the environment of Haiti have suffered badly. This such an important post/guest post!! The lies and phony concerns of Progressives et al is more destructive than cigarettes.